BMS means different things to different people. To some it issimply Battery Monitoring, keeping a check on the key operationalparameters during charging and discharging such as voltages andcurrents and the battery internal and ambient temperature. Themonitoring circuits would normally provide inputs to protectiondevices which would generate alarms or disconnect the battery fromthe load or charger should any of the parameters become out oflimits. For the power or plant engineer responsible for standby power who'sbattery is the last line of defence against a power blackout or atelecommunications network outage BMS means Battery ManagementSystems. Such systems encompass not only the monitoring andprotection of the battery but also methods for keeping it ready todeliver full power when called upon and methods for prolonging itslife. This includes everything from controlling the charging regimeto planned maintenance. For the automotive engineer the Battery Management System is acomponent of a much more complex fast acting Energy ManagementSystem and must interface with other on board systems such asengine management, climate controls, communications and safetysystems. In order to control battery performance and safety it is necessaryto understand what needs to be controlled and why it needscontrolling. This requires an in depth understanding of thefundamental cell chemistries, performance characteristics and battery failure modes particularly Lithium battery failures. The battery can not simply be treated as a black box. Maintain the battery in a state in which it can fulfil thefunctional requirements of the application for which it wasspecified. Cell Protection Protecting the battery from out of tolerance operating conditionsis fundamental to all BMS applications. In practice the BMS mustprovide full cell protection to cover almost any eventuality.Operating a battery outside of its specified design limits willinevitably lead to failure of the battery. Apart from theinconvenience, the cost of replacing the battery can beprohibitive. This is particularly true for high voltage and highpower automotive batteries which must operate in hostileenvironments and which at the same time are subject to abuse by theuser. Charge control This is an essential feature of BMS. More batteries are damaged byinappropriate charging than by any other cause. Demand Management While not directly related to the operation of the battery itself,demand management refers to the application in which the battery isused. Its objective is to minimise the current drain on the batteryby designing power saving techniques into the applicationscircuitry and thus prolong the time between battery charges. SOC Determination Many applications require a knowledge of the State of Charge (SOC)of the battery or of the individual cells in the battery chain.This may simply be for providing the user with an indication of thecapacity left in the battery, or it could be needed in a controlcircuit to ensure optimum control of the charging process. SOH Determination The State of Health (SOH) is a measure of a battery's capability todeliver its specified output. This is vital for assessing thereadiness of emergency power equipment and is an indicator ofwhether maintenance actions are needed. Cell Balancing In multi-cell battery chains small differences between cells due toproduction tolerances or operating conditions tend to be magnifiedwith each charge / discharge cycle. Weaker cells becomeoverstressed during charging causing them to become even weaker,until they eventually fail causing premature failure of thebattery. Cell balancing is a way of compensating for weaker cellsby equalising the charge on all the cells in the chain and thusextending battery life. 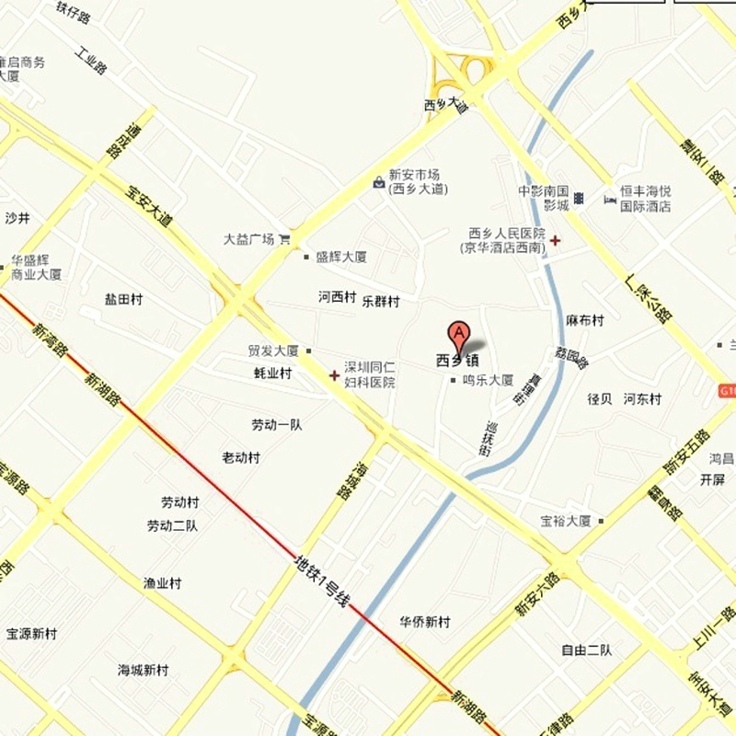 History - (Log Book Function) Monitoring and storing the battery's history is another possiblefunction of the BMS. This is needed in order to estimate the Stateof Health of the battery, but also to determine whether it has beensubject to abuse. Parameters such as number of cycles, maximum andminimum voltages and temperatures and maximum charging anddischarging currents can be recorded for subsequent evaluation.This can be an important tool in assessing warranty claims. Authentication and Identification The BMS also allows the possibility to record information about thecell such as the manufacturer's type designation and the cellchemistry which can facilitate automatic testing and the batch orserial number and the date of manufacture which enablestraceability in case of cell failures. Communications Most BMS systems incorporate some form of communications betweenthe battery and the charger or test equipment. Some have links toother systems interfacing with the battery for monitoring itscondition or its history. Communications interfaces are also neededto allow the user access to the battery for modifying the BMScontrol parameters or for diagnostics and test. The following examples illustrate three very different applicationsof BMS in action. The life of rechargeable NiCad and Nickel Metal Hydride batteriessuch as those used in power tools can be extended by the use of anintelligent charging system which facilitates communicationsbetween the battery and the charger. The battery providesinformation about its specification, its current condition and itsusage history which is used by the charger to determine the optimumcharging profile or, by the application in which it is used, tocontrol its usage. The prime objective of the charger/battery combination is to permitthe incorporation of a wider range of Protection Circuits which prevent overcharging of, or damage to, the battery and thusextend its life. Charge control can be in either the battery or thecharger. The objective of the application/battery combination is toprevent overloads and to conserve the battery. Similar to thecharger combination, discharge control can be in either theapplication or in the battery. Although some special cells incorporating intelligence have beendeveloped, the intelligence is more likely to be implemented in abattery pack. The Intelligent Battery, or Smart Battery, provides outputs fromsensors which give the actual status of voltages, currents andtemperatures within the battery as well as the state of charge. Itcan also provide alarm functions indicating out of toleranceconditions. The system also requires devices which may be in either the batteryor the charger or both which can interrupt or modify the chargingaccording to a set of rules. Similarly, battery discharge can becontrolled by the battery or demand management circuits in theapplication. The Intelligent Battery also needs an Intelligent Charger it cantalk to and a language they can speak. The charger is programmed to respond to inputs from the battery, tooptimise the charging profile, charging at the maximum rate until apreset temperature is reached, then slowing down or stopping thecharge and or switching on a cooling fan so as not to exceed thetemperature limit and thus avoid permanent damage to the battery.If a deterioration in the battery internal impedance indicates thatreconditioning is necessary the charger can also be programmed toreform the battery by subjecting it to several deep charge,discharge cycles. Because the battery contains information aboutits specification which can be read by the charger, it is possibleto build Universal Chargers which can automatically adapt thecharging profile to a range of battery chemistries and capacities,so long as they comply with an agreed message protocol. A separate communications channel is needed to facilitateinteractions between the battery and the charger. One example usedfor simple applications is the System Management Bus (SMBus) which forms part of the Smart Battery System which is used mainlyin low power applications. Batteries which comply with the SBSstandard are called Smart Batteries. Intelligent batteries arehowever not limited to the SMS scheme and many manufacturers haveimplemented their own proprietary schemes which may be simpler ormore complex, depending on the requirements of theapplication. A 50% increase in battery life has been claimed by using suchtechniques. As well as talking to the charger, the Intelligent Battery can alsotalk to the user or to other systems of which the battery may be apart. The signals it provides can be used to turn on warning lightsor to inform the user about the condition of the battery and howmuch charge it has left. Monitoring the battery condition is an essential part of allBattery Management Systems. In the first of the following twoexamples, the control actions are manual, - the power plantmaintenance engineer fixes any deficiencies. In the second examplethe battery is part of an Automatic Control System made up fromseveral interlinked feedback loops controlling the battery itselfand its role as part of the overall vehicle energy managementsystem. The battery management requirements are quite different for standbyand emergency power installations. Batteries may be inactive forlong periods topped up by a trickle charge from time to time, or asin telecommunications installations they may be kept on floatcharge to keep them fully charged at all times. By their nature,such installations must be available for use at all times. Anessential responsibility of managing such installations is to knowthe status of the battery and whether it can be relied upon tosupport its load during an outage. For this it is vital to know theSOH and the SOC of the battery. In the case of lead acid batteriesthe SOC of individual cells can be determined by using a hydrometerto measure the specific gravity of the electrolyte in the cells.Traditionally, the only way of determining the SOH was by dischargetesting, that is, by completely discharging the battery andmeasuring its output. Such testing is very inconvenient. For alarge installation it could take eight hours to discharge thebattery and another three days to recharge it. During this time theinstallation would be without emergency power unless a back upbattery was provided. The modern way to measure the SOH of a battery is byimpedance testing or by conductance testing . It has been found that a cell's impedance has an inversecorrelation with the SOC and the conductance being the reciprocalof the impedance has a direct correlation with the SOH of the cell.Both of these tests can be carried out without discharging thebattery, but better still the monitoring device can remain in placeproviding a permanent on line measurement. This allows the plantengineer to have an up to date assessment of the battery conditionso that any deterioration in cell performance can be detected andappropriate maintenance actions can be planned. as the vehicle accelerates and brakes, and it has to work in aharsh and uncontrolled environment. This example describes acomplex system as an illustration of what is possible, however notall applications will require all the functions shown here. Setting the battery operating point to allow regenerative brakingcharges to be absorbed without overcharging the battery. 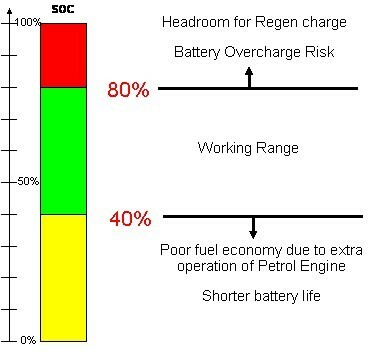 Providing information on the State of Charge (SOC) of the battery.This function is often referred to as the "Fuel Gauge" or "GasGauge "
Providing information on the State of Health (SOH) of the battery.This measurement gives an indication of the condition of a usedbattery relative to a new battery. In practical systems the BMS can thus incorporate more vehiclefunctions than simply managing the battery. It can determine thevehicle's desired operating mode, whether it is accelerating,braking, idling or stopped, and implement the associated electricalpower management actions. One of the prime functions of the Battery Management System is toprovide the necessary monitoring and control to protect the cellsfrom out of tolerance ambient or operating conditions. This is ofparticular importance in automotive applications because of theharsh working environment. As well as individual cell protectionthe automotive system must be designed to respond to external faultconditions by isolating the battery as well as addressing the causeof the fault. For example cooling fans can be turned on if thebattery overheats. If the overheating becomes excessive then thebattery can be disconnected. Protection methods are discussed in detail in the section onProtection. Determining the State of Charge (SOC) of the battery is the secondmajor function of the BMS. The SOC is needed not just for providingthe Fuel Gauge indication. The BMS monitors and calculates the SOCof each individual cell in the battery to check for uniform chargein all of the cells in order to verify that individual cells do notbecome overstressed. The SOC indication is also used to determine the end of thecharging and discharging cycles. Over-charging and over-dischargingare two of the prime causes of battery failure and the BMS mustmaintain the cells within the desired DOD operating limits. Hybrid vehicle batteries require both high power chargecapabilities for regenerative braking and high power dischargecapabilities for launch assist or boost. For this reason, theirbatteries must be maintained at a SOC that can discharge therequired power but still have enough headroom to accept thenecessary regenerative power without risking overcharging thecells. To fully charge the HEV battery for cell balancing (Seebelow) would diminish charge acceptance capability for regenerativebraking and hence braking efficiency. The lower limit is set tooptimise fuel economy and also to prevent over discharge whichcould shorten the life of the battery. Accurate SOC information istherefore needed for HEVs to keep the battery operating within therequired, safe limits. Methods of determining the SOC are described in the sectionon State of Charge. 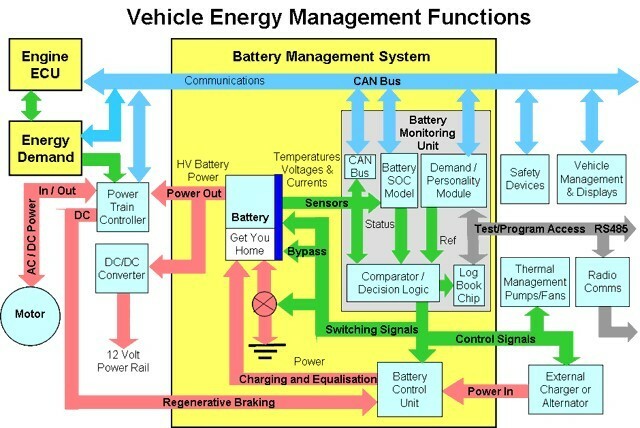 shows the three main BMS building blocks, the Battery MonitoringUnit (BMU), the Battery Control Unit (BCU) and the CAN bus vehiclecommunications network and how they interface with the rest of thevehicle energy management systems. Other configurations arepossible with distributed BMS embedded in the battery cell to cellinterconnections. In practice the BMS may also be coupled to other vehicle systemswhich communicate with the BMS via the CAN bus (see below) such asthe Thermal Management System or to anti theft devices whichdisable the battery. There may also be requirements for systemmonitoring and programming, and data logging using an RS232 serialbus. The Battery Monitoring Unit is a microprocessor based unitincorporating three functions or sub-modules. These sub-modules arenot necessarily separate physical units but are shown separatelyhere for clarity. The Battery Model characterises in a software algorithm, thebehaviour of the battery in response to various external andinternal conditions. The model can then use these inputs toestimate the status of the battery at any instant in time. An essential function of the battery model is to calculate the SOCof the battery for the functions noted above. The SOC is determined essentially by integrating the current flowover time, modified to take account of the many factors whichaffect the performance of the cells, then subtracting the resultfrom the known capacity of the fully charged battery. This isdescribed in detail in the section on SOC. The battery model can be used to log past history for maintenancepurposes or to predict how many miles the vehicle may run beforethe battery needs recharging. The remaining range, based on recentdriving or usage patterns, is calculated from the current SOC andthe energy consumed and the miles covered since the previous charge(or alternatively from a previous long term average). The distancetravelled is derived from data provided by other sensors on the CANbus (see below). The accuracy of the range calculation is more important for EVswhose only source of power is the battery. HEVs and bicycles havean alternative "Get you home" source of power should the batterybecome completely discharged. The problem of losing all power when a single cell fails can bemitigated at the cost of adding four more expensive contactorswhich effectively split the battery into two separate units. If acell should fail, the contactors can isolate and bypass the half ofthe battery containing the failed cell allowing the vehicle to limphome at half power using the other (good) half of thebattery. Outputs from the model are sent to the vehicle displays also usingthe CAN bus. To reduce costs, instead of monitoring each cell in parallel, theBattery Monitoring Unit incorporates a multiplexing architecturewhich switches the voltage from each cell (input pairs) in turn toa single analogue or digital output line (see below). Cost savingscan be realized by reducing the number of analogue control and/ordigital sampling circuits and hence the component count to aminimum. The drawbacks are that only one cell voltage can bemonitored at a time. A high speed switching mechanism is requiredto switch the output line to each cell so that all cells can bemonitored sequentially. The BMU also provides the inputs for estimating the SOH of thebattery, however since the SOH changes only gradually over thelifetime of the battery, less frequent samples are needed.Depending on the method used to determine the SOH, samplingintervals may be as low as once per day. Impedance measurements forexample could even be taken only in periods when the vehicle is notin use. Cycle counting of course can only occur when the vehicle isoperational. The Demand Module is similar in some respects to the Battery Modelin that it contains a reference model with all the tolerances andlimits relevant to the various parameters monitored by the BatteryModel. The Demand Module also takes instructions from thecommunications bus such as commands from the BMS to accept aregenerative braking charge or from other vehicle sensors such assafety devices or directly from the vehicle operator. This unit isalso used to set and to monitor the vehicle operating modeparameters. This module is sometimes called the Personality Module sinceincludes provision for programming into the system, all the customrequirements which may be specific to the customer's application.For example, the cell maker will recommend a temperature limit atwhich for safety reasons the battery must be automaticallydisconnected. However the car manufacturer may set two lowerlimits, one at which forced cooling may be switched on and anotherwhich lights up a warning light on the driver's instrumentpanel. For HEV applications, the Personality Module interfaces with theengine Electronic Control Unit (ECU) via the CAN bus. Provision ismade in this module for setting the desired system SOC operatingrange and the parameters for controlling the power sharing betweenthe electric drive and the internal combustion engine . The Demand Module also contains a memory block for holding all thereference data and for accumulating the historical data used formonitoring the battery SOH. Data to display the SOH or switch onwarning lights can be provided to the vehicle instrumentationmodule via the CAN bus. The outputs from the Demand Module provide the reference points forsetting the operating conditions of the battery or triggering theaction of protection circuits. Test access to the BMS for monitoring or setting system parametersand for downloading the battery history is provided through astandard RS 232 or RS485 serial bus. The Decision Logic module compares the status of the measured orcalculated battery parameters from the Battery Model with thedesired or reference result from the Demand Module. Logic circuitsthen provide error messages to initiate cell protection actions orto be used in the various BMS feedback loops which drive the systemto its desired operating point or isolate the battery in the caseof unsafe conditions. These error messages provide the inputsignals for the Battery Control Unit. The BMS needs a communications channel for passing signals betweenits various internal functional circuit blocks. It must alsointerface with several external vehicle systems for monitoring orcontrolling remote sensors, actuators, displays, safety interlocksand other functions. Automotive BMS therefore uses the CAN bus which was designed for this purpose as its main communicationschannel. The Battery Control Unit contains all the BMS power electronicscircuitry. It takes control signals from the Battery MonitoringUnit to control the battery charging process and to switch thepower connections to individual cells. Controlling the voltage and current profile of the charger outputduring the charging process. Providing top up charge to individual cells to equalise the chargeon all cells in the battery chain. 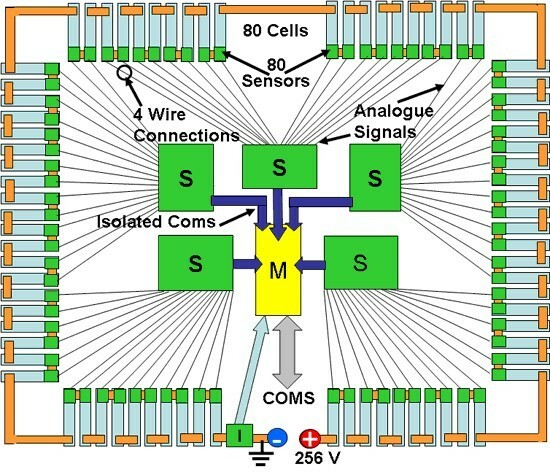 To provide these functions, each cell in the battery may requireexpensive high current switches capable of switching 200 Amps ormore to provide the necessary interconnections. In its simplest form, the BMS privides a "binary" ON/OFF resonse toa fault or an out of tolerance condition such as an overload,merely isolating the battery completely by opening the maincontactors. Progressive or variable control can however be providedin the case of an overload by utilising the CAN Bus to call for areduced the demand on the battery. This is another essential function of the automotive BMS. As notedabove it is required to compensate for weaknesses in individualcells which could eventually cause the failure of the completebattery. The reasons for cell balancing and how this is implementedare explained on the Cell Balancing page. Although batteries are designed to be trouble free for 3 or moreyears, there is always the possibility that the battery could bedisabled by the failure of a single cell. If a cell goes opencircuit, the battery is essentially dead. However the BMS isdesigned to monitor the status of every cell and so the location ofthe faulty cell will automatically be identified. It is notdifficult to split the battery into two sections in series, each ofwhich can be independently bypassed by disconnecting the section ofthe battery containing the faulty cell and switching a conductinglink in its place. This will allow the vehicle to get to home or tothe nearest refuge on half power using the good section of thebattery. As well as the links the system will need two moreexpensive high power contactors to implement this function, butthis investment may be well justified when the alternative could bea costly and dangerous breakdown on the motorway. Automotive BMSs may also be required to provide various functionswhich are not necessarily essential to managing the battery. Thesemay include remote monitoring of the battery from the fleetheadquarters and this may also include the GPS location of thevehicle. The driver could thus be warned if the vehicle was gettinglow on charge or if he was straying too far from a chargingstation. Fortunately not all BMS applications are as complex as thisone. There are many ways of implementing the battery management systemand two different examples for a 256 Volt battery made up from 80Lithium Iron Phosphate cells are shown below. The master and slaves, star topolgy, organises the cells intoblocks or modules with one slave managing each module. In theexample shown, 16 X 3.2 volt cells are arranged in modules eachwith an output voltage of 51.2 Volts but other module sizes andvoltages are possible. The Slaves - Each cell has a temperature sensor as well as connections tomeasure the voltage, all of which are connected to the slave whichmonitors the condition of the cell and implements the cellbalancing. The Master - Multiple slaves can be connected to the master which monitors thecurrent and integrates it over time to calculate the net Coulombflow and this is modified using voltage and temperature data fromthe slaves to calculate the battery SOC. The master controls themain battery isolation contactor(s) initiating battery protectionin response to data from the main current sensor or voltage andtemperature data from the slaves.The master also provides thesystem communications. This configuration has the advantages that it does not need printedcircuit boards connected to individual cells and high voltagebatteries can be accommodated by adding more modules and since themain battery current does not pass through slaves, it can also beused for high current batteries. Signal processing is sharedbetween the master and the slaves simplifying the management of theinformation processing load. Disadvantages are that the communications between the sensors andthe slaves are in analogue form, and thus susceptible to noise, andthe very large number of sensor wires, four per cell, which arerequired. 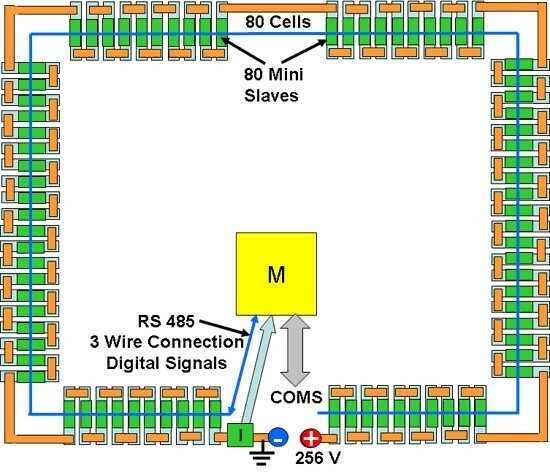 Opto-isolated connections between the slaves and themaster are also required since the votages on the slaves wouldotherwise be progressively higher, up to the full battery voltage,as connections are taken from further up the cell chain. The daisy chain, ring topology, uses a small simple slave printedcircuit board connected to each cell to accommodate the voltage andtemperature sensors with an A to D converter, as well as a currentbypass switch to enable cell balancing by charge shunting and an communications transceiver with built in capacitiveisolation for receiving and transmitting data in digital form. Theslave takes its power from the cell it is monitoring and asingle RS 485 three wire data bus connects the nodes from all the slaves to themaster which polls each node in turn and requests an update of itscell conditions. The slave does not carry out any signalprocessing, apart from the A to D conversion, as this is allcarried out by the master along with all the monitoring, protectionand communications functions as in the example above. The main advantages of this topology are its simpler design andconstruction and its potential for higher reliability in anautomotive environment. The disadvantages are the large number of mini-slave printedcircuit boards which are needed and the difficulty of mounting themon some cell types. In addition the master has a higher processingload.